When I was training as a Life Coach and establishing my niche in the area of Retirement Lifestyle, I realized that coaching offers many ideas and attitudes we need as we embrace the retirement phase of our lives. The idea occurred to me to write a book, based on coaching concepts, that would resonate with retirement planners. The fusion confers real meaning and passion to this miraculous phase of life. If you view retirement as a career change, you can make this one the career from heaven! Decide what criteria your want your new career to reflect. Do you want to work from home? Do you wish to meet new people? Study in a new field? Do you wish to start a small business? Are there financial considerations? Read full excerpt (pdf). Enjoy your body and take care of your health. As they say, “If you don’t take care of your body, where are you going to live?” Enjoy your family, your friends and the neighbours. Celebrate with others Read full excerpt (pdf). I love the way you lead the reader through the book with powerful questions and real-life examples. Rich Fettke, MCC, Past-President of the Professional and Personal Coaches Association and Author of Extreme Success. Barbara’s book gave me an entirely new, exciting, positive perspective on retirement. That alone made it worth the investment of money and time. Irene Leonard, Professional Development Coach and Lawyer. Author of Creating the Practice You Want: A Law Practice Development Work-book. We do such a disservice in our culture to our retirees. They are a valuable resource to be cherished and appreciated. Barbara’s book shows us all how important and possible it is to remain fully active and vibrant in our latter years. A must read for all, not just retirees. For with age comes great wisdom! Rick Tamlyn Co-active Coach, Trainer, Founder, It’s All Made Up, Inc. 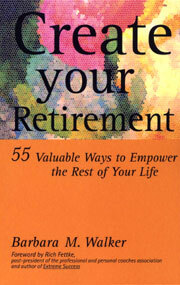 This book offers valuable information not only about ‘how’ but ‘why’ to create a fulfilling lifestyle in retirement. Talane Miedaner, Author of Coach Yourself To Success: 101 Tips from a Personal Coach for Reaching Your Goals at Work and in Life. Retirement offers choice and challenges. You can travel, pursue a new career, write a book or do all three. You will discover how to create the (rest of your) life you want. Dan Poynter, The Self- Publishing Manual, http://ParaPub.com. Create Your Retirement is the perfect solution for people approaching retirement and wondering what they’ll do next, and for those already retired and asking if this is all there is. Unlike other books on retiring that focus on financial planning, Barbara Walker has written a book for the ‘new retirees,’ the baby boomers still young at heart, who are seeking fulfillment, value and purpose in their retirement years. Barbara’s practical exercises and enthusiastic style encourage readers to expand their traditional thinking about retirement to discover a new path, implement changes, and create a plan for the rest of their lives. C.J. Hayden, MCC, Author of Get Clients Now!